The legendary rock-pop team of Kenny Loggins and Jim Messina was reunited with their home audience this past Saturday, enlivening the Bowl for the first time since their 2005 reunion tour. The dynamic duo wasted no time picking up where they left off, captivating the all-ages crowd for nearly two hours through a heavy dose of clean-toned Stratocasters, guest musician solos, and those classic two-part harmonies which first brought them stardom. 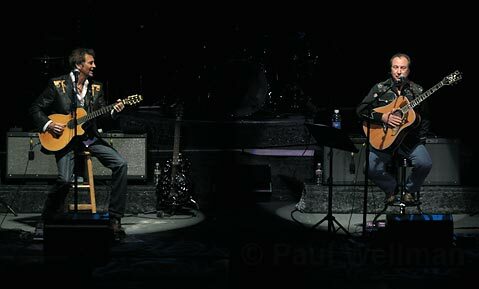 Opening the evening in a self-proclaimed campfire style, the pair warmed the crowd with their timely acoustic classics – “Danny’s Song” and “House on Pooh Corner” were played back-to-back to open the show – and tribute ballads to Sir Paul McCartney and Ray Charles. Operating as an eight piece-troupe, the singer-songwriters were flanked by two chameleon wind ensemble members, whose performances climaxed in an epic saxophone duel after the first encore. Emphasizing Loggins’s roots as a songwriter, the night also showcased vibrant fiddle melodies and even mandolin solos from Messina himself. Pianist and songwriter Gabe Dixon – whose two-piece Gabe Dixon Band jumpstarted the night’s festivities – handled the ensemble’s keyboard duties, sustaining the vocal melodies throughout the evening. Dixon, who toured with Loggins and Messina back in 2005, recently achieved success in his solo career through the incorporation of his song “Find My Way” as the opening track to the film The Proposal, starring Sandra Bullock and Ryan Reynolds. Messina – who began his career with Buffalo Springfield – first teamed up with Loggins in 1970, achieving joint popularity in the early ’70s after the smash hit recording, Sitting’ In. This year’s tour, dubbed “Together Again,” is the group’s second comeback tour since “Sittin’ In Again” in 2005.